What a great, unexpected selection of flags. I was very excited the first time I saw that dragon. In early 2016, in between my masters and PhD, I worked for 3 months in Ghana as a team leader for an international citizen service programme. 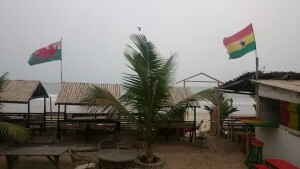 I had chosen Ghana as I had made some Ghanaian friends through my very multicultural masters cohort and I had heard about some waves and some surfy projects that were happening not far from the capital city. As a UK government funded scheme, the recruitment process was pretty tough- I had to do an application form, a phone interview and then head over to London for a full day assessment including cringey team challenges and a presentation about something that you want to talk about. For mine, I talked of surfing about the opportunities it has opened up for me; the travel, the friends, the waves; I talked of the things it has made me learn; the snippets of oceanography, meteorology and marine biology that I have picked up along the way; the benefits it brings to my wellbeing. I presented well, with a confidence that came with knowing what I was talking about and sure of the impact that it had had on me and could have on others. I got the job. Well, I was selected as a volunteer team leader and I would move through the rest of the process. A few weeks before I was due to leave, I had a phonecall from the office in Edinburgh to go through some safety stuff.. they said I wouldn’t be allowed to go in the sea. I almost didn’t go; I shouldn’t have gone. I don’t know why but I thought that things would be different on the ground, or some leeway would be provided to allow me to go for a surf. I knew that there was a reputable surf school near the city I would be based in, and that I I was a confident water user. 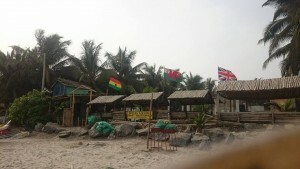 I went through the brief training in the UK, and flew out to Ghana. I wont go into it here but I really didn’t enjoy the experience. The safety and security elements were so severe that it made me simultaneously paranoid and restricted. The no go sea rule was extremely strictly enforced, to the point where two volunteers were dismissed on the spot and flights were arranged for them to be sent home- all for going to above knee deep in water at the beach while playing catch. After this palava I had to negotiate with management to allow us to walk along the shoreline. Anything over ankle depth was not allowed. This was the first time I had been denied access to surfing and the sea. There were risks involved certainly- water quality was poor and the open beach hosted some nasty rips; but I was not allowed to weigh up these risks and decide for myself whether to go or not. It was not a nice experience; it made me want to go in the sea more, and I found that my way to chill out, recharge and have fun was taken away from me. Fortunately, the times I did make it out to the beach, the waves were poor and my energy levels were low so it made it easier to have to sit on the beach in the baking heat. Still, it would have been great to get in the water. Surfing has become an integral part of most of my travelling experiences; when considering a new location I normally google …surf before making a decision. To be so close to surfing on another continent and then be held back was extremely frustrating and when coupled with a tough job in a very challenging environment, it was almost debilitating. My productivity was far lower as a result of the rule- I was resentful of it and I was less able to manage the stress that I was subjected to. When considering compulsion, and the draw of the sea, I first thought of times when going surfing has made me want to go surfing again; or when the pull of the ocean has made me jump in the car and find a wave. The exclusion of surfing from my possibilities however is likely the most striking example of how I have been affected by the need to catch a wave or just be in the sea. Through writing that down, I just relived that tension of being told no way- remembering thinking “ argh if I go surfing today, I’ll get to go surfing AND they’ll send me home…that’s a win win…”. This was at a beach that I had no prior association with, no connection. Just a want to test it out, to catch some waves. I was really annoyed that I was blocked from accessing the water at a new break, with poor conditions and questionable water quality. I guess I just realised that if someone told me about something that might stop me surfing elsewhere, my home break perhaps, then yeah I’d kick up a fuss and try to keep it so that I could surf there. 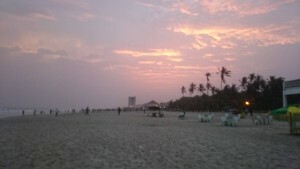 Labadi beach. the other side of the city. This beach got extremely busy but there were never any waves. even though i couldnt go in the sea it still felt good to be at the beach.